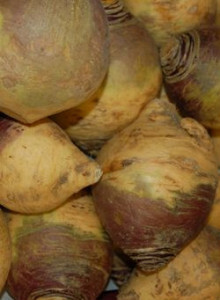 Turnips: Turnips are very low in Saturated Fat and Cholesterol. They’re also a good source of Vitamin B6, Folate, Calcium, Potassium and Copper, and a very good source of Dietary Fiber, Vitamin C and Manganese. Use sliced or cubed in stews or salads. 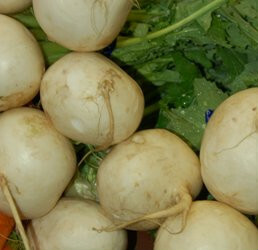 Japanese or White Turnips: This turnip is tender, mild, sweet, and crunchy. Select small to medium turnips that are firm, without bruises, soft spots, or signs of shriveling. To enjoy, simply peel, slice or dice, and eat raw with a vegetable dip, or sliced into your green salad, potato salad or three-bean salad. Delicious peeled, slightly salted, and spritzed with lemon juice.